Jonny Depp’s mathematician (Will Caster) is a leading light in artificial intelligence. Rebecca Hall is his partner and Paul Bettany is his friend. Caster is shot by a Luddite afraid of the hubristic implications of his research and his group sabotage decades of it. Caster dies but his consciousness is updated to a mainframe in the desert. Hall is his faithful helper but Bettany’s doubts lead him to being recruited by the Luddites and then by the government fearful of the threat Caster’s intelligence poses. Is Hall won over to Bettany’s cause, what happens to Caster? At first I dismissed this as solemn bog standard sci-fi which, like the film I Robot, tends to side-step the more complicated issues concerning what it is to be human vis a vis artificial intelligence. Depp’s disembodied face in the computer almost had me giggling, as it made me want for his Jack Sparrow routine in Pirates of the Caribbean. It doesn’t help that Hall and Bettany are lumbered with such corny roles: Hall being superstitiously reverential to any scientific project (no matter how Faustian), and Bettany the tortured voice of conscience (a role appropriated by a British actor allowed to be a good guy). The film itself can’t resist the Humanities’ default mode, which insists if you can’t beat science you might as well worship it. Will Depp undergo a spiritual change when endowed with God-like power? The human element in this sort of sci-fi consists of the emotional confessional directed at due humility. In spite of these familiar burdens, the film is not as bad as its hostile critical reception would tell you. After all it tackles the same subject as Her in which Scarlett Johannsen plays a disembodied intelligence in a mobile phone, yet I heard no disbelieving laughter there. Transcendence steers between scientific hubris and the redemptive power of love with a fair degree of aplomb. Its lack of reliance on clunkingly silly special effects shouldn’t necessarily be held in its favour, but its few effects are all the more effective. Morgan Freeman plays concerned scientist friend with his usual statesmanlike gravitas. 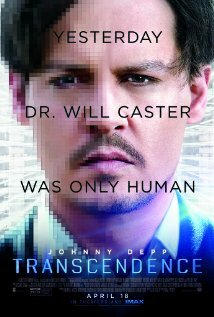 Given its potential for absurdity, Transcendence manages to be thoughtful, and occasionally well argued enough to be worth a careful viewing. 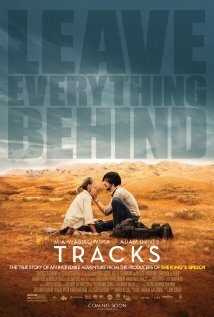 Starring Mia Wasikowska as Robyn Davidson who crossed the Australian desert in 1977 with four camels and a dog. Adam Driver plays the National Geographic photographer (Rick Smolen) who meets up with her in a few places. At one stage she has to have a native Australian guide (Roly Mintuma) to take her through sacred places. As you might expect Robyn Davidson is very much a reserved, resourceful loner, and in the 70s these qualities in a woman were bound to arouse the control-freakery of the patriarchal male. Smolan shows the sort of eagerness to appropriate (sexually and professionally) that which Bryan Brown showed to Diane Fossey in Gorillas in the Mist. Women simply didn’t go off into the desert alone (or spend quality time with gorillas), so one can see Smolen feel a sort of jealousy towards Davidson’s desire for self-sufficiency and resourcefulness. As a drifting Alpha male in a poor country, he must of course have a glamorous job so naturally he is a photographer. Tracks takes us through Davidson learning how to control camels. This appears to be a difficult art that members of the Stuart and Willis 1861 expedition never properly mastered. Bruce Chatwin in his book Song Lines discusses nomadism as a defining characteristic of being human, and one can see that the journey is a sort of metaphor of Davidson’s search for self mastery. She is terse and difficult. One can see what inspired Christopher Nolan in his paintings of the Outback. The landscape is framed in dawn dusk chiaroscuros, etching around the emerging golds, deepening to ochre. Her meetings with people are cursory, marked by nearly uninterrupted silence. She doesn’t show much conversational mileage with camels. Tourists are, as always, shown to be foolish and intrusive; there to accentuate her precious isolation. Impressive. Ayoade made Submarine about teen angst and The Double is about another oddball young man, Simon James (played by Jessie Eisnberg). The nerdy Simon meets his double (naturally Eisenberg), but it seems no one notices this. At work he’s humiliated by his boss and further undermined by his double. Mia Wasikowska plays the girl he dreams of. 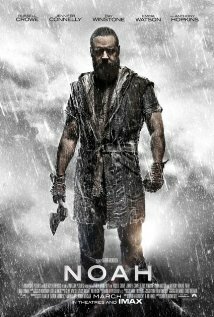 Does he emulate a suicide we see early in the film? Can anyone come to his rescue? 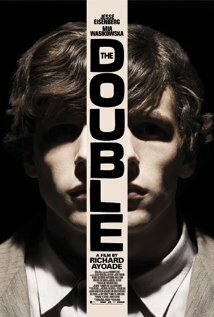 Based on a story by Dostoevsky The Double has obvious influences. It’s like a David Lynch film about a beaten down character from a Kafka story. Like Lynch’s Eraserhead it shows an alienated puritanical disgust with the details of everyday physical existence. Simon wears ill fitting clothes which only accentuate his solipsistic oddness. His isolation is exacerbated by the dirt and tackiness of his bureaucratised nightmarish world. No one is pleasant or friendly, everyone takes refuge in cryptic weirdness. The retro look can be quite cloyingly cliched but Ayoade pulls off the trick of managing to make it funny and disturbing. The Double especially wallows in its recreation of an East European communist state around 1950, complete with Orwellian bureaucracy and deadpan eccentric monologues effectively pre-empting the opportunity for reasoned dialogue. Eisenberg as Simon holds our attention throughout, are we dealing with a split personality or is there a real doppelganger out there? One Simon is the pathetic nerd (think Woody Allen as Joseph K) and the other is the opposite, the sleazy chancer successful with women. The Double keeps us guessing until the end, and it made me fee that this is a story that could have strayed in from Twin Peaks. At one point Simon watches a ’70s sci-fi programme on his bakelite TV and it reminded me how awful and cardboardish those productions were. Like a Twilight Zone story set in communist Albania. Absorbing.